As the photographic evidence to the right can attest, I am now a “public debater.” Well, I guess the recent passings of Christopher Hitchens and Steve Jobs have left an intellectual vacuum in the public space that is eager to be filled by somebody who combines the modesty of the one with the intellectual honesty of the other. Somebody like me. 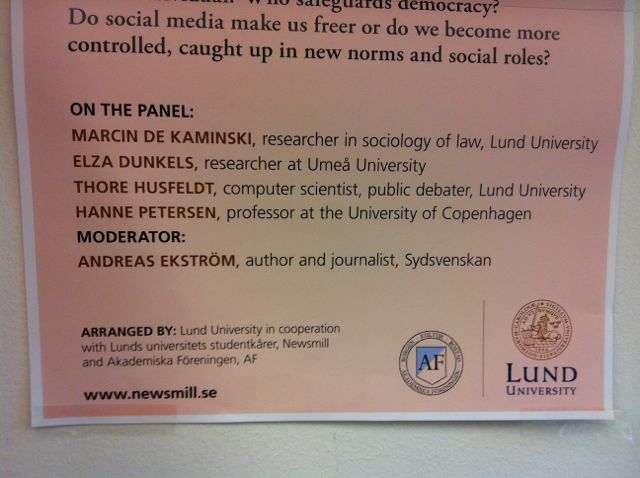 In fact, the epithet comes from a poster for a panel debate about the blessings of the Internet arranged by the Social Sciences at Lund University, Debatt i Lund. I was really happy to be invited and had a good time; I hope this sets a precedent for more involvement of academics from the technical and natural sciences. The nerds. In preparing for the debate, I spent some time reading or re-reading a few general-audience books about various societal aspects of the Internet, including the relatively recent The Filter Bubble and Program or be Programmed. I remain impressed by Blown to Bits, which combines a minimal amount of alarmism with an honest ambition to actually explain what is going on. It’s written by nerds, so the facts are correct. For nonspecialists, this should be the one book to read. I also refreshed some sociological aspects. As a newly minted public intellectual I feel it behooves me to drop Foucault into conversation at regular intervals, instead of my usual spiel of an intertextual hodgepodge of Star Trek, Monty Python, and fantasy novels. Foucault is topical because of his treatise on discipline and punishment that includes a famous description of modern society in terms of prison architecture. This design goes back to the English utilitarianist Jeremy Bentham and is called the Panopticon: the prison is circular, with a centrally placed warden able to inspect all the cells on the perimeter. This is clever not so much for the actual surveillance, but for the inmate’s constant knowledge of being potentially watched. It’s a correction facilty by design. While I think this is a valid concept, I’m not too fond of the name. Panspectron. It’s basically the same word as Panopticon, with Latin replacing the Greek. Panmnemonicon n. 1. A device or set of devices that records and stores everything. 2. A society operating under the influence of such a device. Panmnemonicon translates to something like “all-remembering”, which I think is the point of our brave new world. After all, nobody actually watches you or me; mostly because nobody cares about you or me. Instead, everything is stored with the possibility of later being retrieved and mined, should you or I suddenly become interesting. That’s the worrying point, and the one that has potential impact on behaviour. So there it is. A new word minted. Remember it, as it surely will remember you. At the time of writing, Panmnemonicon has a total of 0 hits on Google. Panspectron does have some hits, but not enough for me to Google Trend it. We’ll see how it goes. It’s so on, Panspectron. This entry was posted in Uncategorized on May 2, 2012 by thorehusfeldt. I prefer Spock to Foucault.